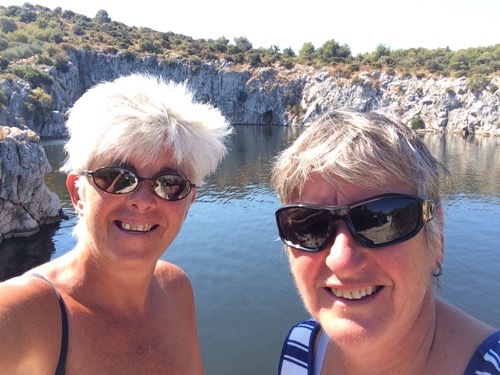 We left our friends, Sue and Sheila, to continue their holiday in Croatia on the Saturday morning whilst we re-provisioned and cleaned the boat. Zadar is a lovely town with great restaurants and a maze of little alleyways to explore. We were moored slightly out of town in Marina Borik as the main marina is full at the weekends due to the charter fleets that operate out of it. We left Sunday morning around midday and made our way over to Preko to refuel. We had hoped to change our cooking gas bottle but the chandlery was shut and the fuel berth only had small ones. 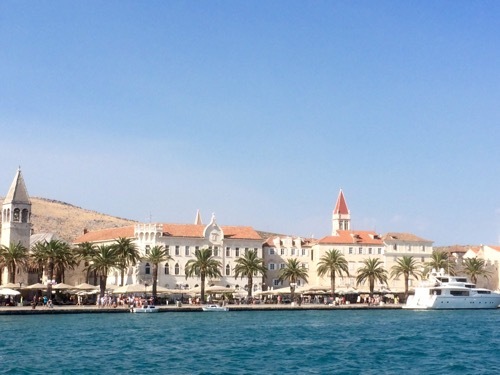 We wanted to make reasonable headway down towards Trogir so we sailed down to Otok Murter. By the evening the wind has really blown up so we wanted a large safe anchorage with good holding. The next morning, the forecast was for more strong winds but we wanted to go round the corner to Tisno where Croatian beach parties are ‘legendary’. The water was turquoise and incredibly clear so we anchored off the beach. The music was blaring at 10.30am so Liz was happy. However, when we kayaked ashore, it was clear that there are two beach bars competing with each other – pretty much cancelling each other out – so it became a din rather than funky music. 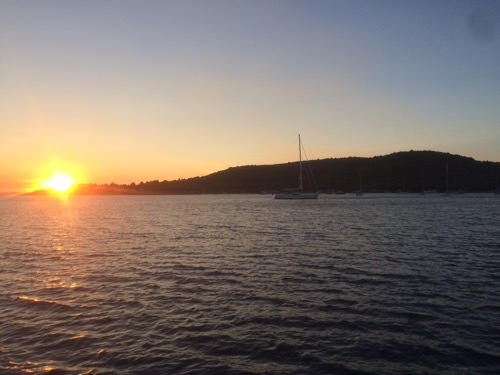 We decided to make towards Primosten on the mainland, about 15nm from Trogir for our evening stop. The wind was building up to over 25 knots but with it behind us, we managed to get 6.8 knots with just half of the genoa (front headsail) out. Fabulous. However, when we arrived at Primosten the swell was coming straight into the harbour so making it untenable for the night. By this time is was after 7pm so we knew we had another 90 mins of light left. 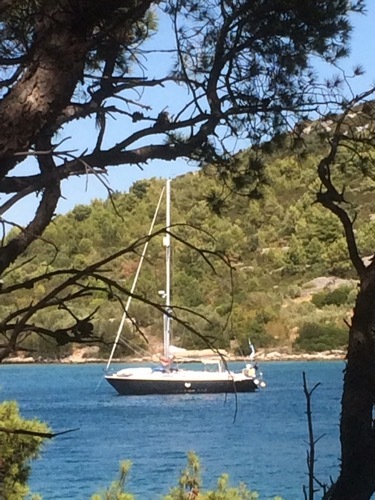 We went round the corner to Rogoznica which is a huge natural harbour that gives pretty much all round protection – perfect. We arrived around 8pm and amazingly there were mooring buoys free just outside the marina there. We decide to go for them rather than go further round to the anchorage as we had no idea if it would be full and, frankly, we were tired! 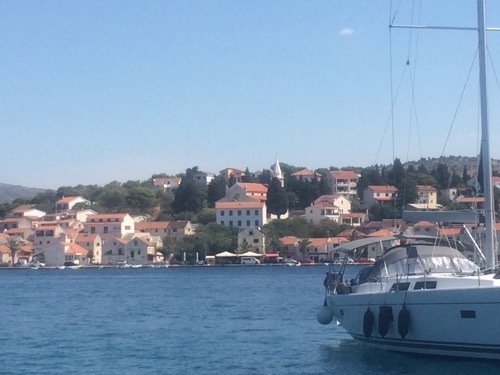 Rogoznica is a pretty town with a sea water lake called Dragon’s Eye. It’s a sinkhole that is tidal and the legend goes that the level rises when the dragon is there and falls when it has left to search for food! We left at midday as we only had 15nm to get to Trogir. The wind built up during the afternoon so by the time we arrived at the marina, opposite the old town, the wind was blowing quite hard so mooring was a challenge with just the two of us on board. However, all was okay and we will spend tomorrow exploring this UNESCO World Heritage Site. This entry was posted in News and tagged 2017, Adriatic, Croatia, Med. Bookmark the permalink. looks beautiful Liz! Continue to enjoy!! We are heading for Brac tomorrow. Which bay?